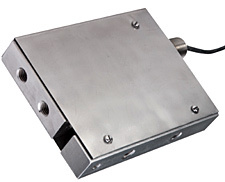 The LCMAD Series platform load cells are hermetically sealed and designed for applications such as industrial food processing and weighing and automated weighing stations, where high accuracy and watertightness are important. The all stainless steel construction and rugged design make the LCMAD load cells accurate and reliable even in washdown areas. The LCMAD is also available in standard configurations, with 0-50 to 0-1,000 lb ranges. Please see the LCAD for complete details, or contact our Pressure department for more information.